Here's Jay researching his next article. Jay DiMartino is a former writer for ThoughtCo who contributed articles on surfing for 11 years. He spent more than a decade surfing and competing on the famed North Shore of Oahu and covering local and inter-island events all over Hawaii as a contributing writer for H3O magazine. 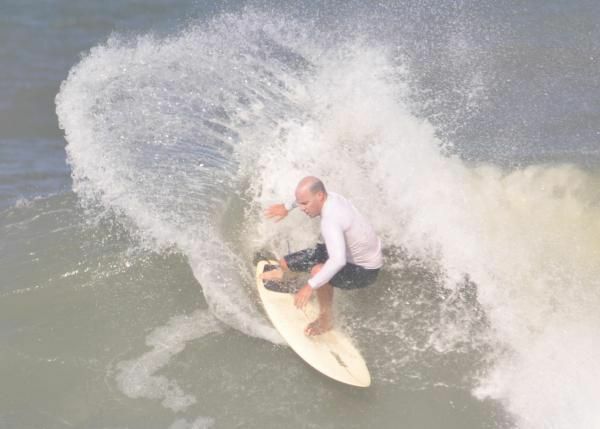 Making his living at the beach and at his computer as a freelance surfing and action sports writer, Jay has written articles for WEND, Pontiac Performance,​ Backstage Pass, and ​Wakesurfing and was quoted in National Geographic. He worked as a consultant on Bearport Publishing's "Super Surfer" series and as the contributing editor for World Champions of Surfing. Trained by the Association of Surfing Professionals, Jay worked and traveled with industry icons Jack Shipley and Michael Ginsberg as part of a professional Hawaiian judging panel. He has also worked for many surf contest organizations. Jay DiMartino has a B.A. in English literature from the University of Hawaii at Manoa. Can You Really Surf in Florida? Who Is Mega-Surfer Kanoa Igarashi?